Hey everybody, Buddy-Girl Greetings is doing fine, I’m sorry I haven’t put out my Valentines cards yet, I will be soon, but by the time I do, I’m sure it will be too late. It’s just really hard to get them out; I had the same trouble last year. But, next year I promise things will be different, as I have done 2 cards this time and I all ready have the 3 cards on the site, I should have be able to launch in 2009 without any delay for new card designs. In my defense I must say that Valentines has never been my favorite holiday so, writing V-Day cards have never came easy. As you may know, neither Helena nor Kisha are that sappy and making sappy cards, are so, not my thing. So, look to next year as I promise to have my act together by then. 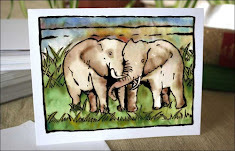 I will have new cards up by early March to include Easter and whatever else I have time to do. Also, look to the fall as I will be redesigning the BGG website to be more user friendly and update the look, it’s been 3 years, it time for a change. Well, I didn’t win anything at the CVG Show, but there is still a chance someone will buy my print of “A Silverdale Morning”. I would like to thank everyone who supported, voted, and came out to see my piece in the show. It means so much to me to have friends, family, and admires who take the time to support me like that. I hope to count on your support next year as I plan on entering and reentering until I win, best in show. Someday, I hope to be able to put on my own gallery show with all my best and favorite works, hope is always good. I’m taking Buddy-Girl Greetings into a new direction; well, I guess a new direction is pretty strong, how about we say, branching off into a new direction. I was want to start a line of apparel and other stuff, nothing fancy at first, just some of my designs on t-shirts and mugs to start. Then maybe someday designing my own line, but that’s way too far into the future to think about now. Okay, so it being Feb 10, how excited am I, why you ask? Cause it’s my Birthday and I’m a Birthday freak. I just love them getting older, getting wiser, getting cake. I love cake, I would eat cake and ice cream like everyday if I could, but then I would be the size of a house and that wouldn’t be good. Still, I love cake. I’m the big 28, although I don’t look a day over 18 as everyone likes to point out, to me. I will say that on a good day I can pass for 21. It’s annoying and fun at the same time; I mean that even though I own my own business and can be pretty driven, I’m a big kid at heart and I plan to stay that way. So, that might have something to do with it, plus the people in my family tend to not age, my mom is 51 and she doesn’t look a day over 39, she could look younger if she dyed her hair. Anyways, I just wanted to share with you all, my Birthday and how much I love them, especially my own, so everyone wish me a Happy Birthday!